Ales are made with yeasts that ferment at the top of the beer mixture. Top fermenting yeast has a higher tolerance to alcohol and ferments at warmer temperatures than lagers. 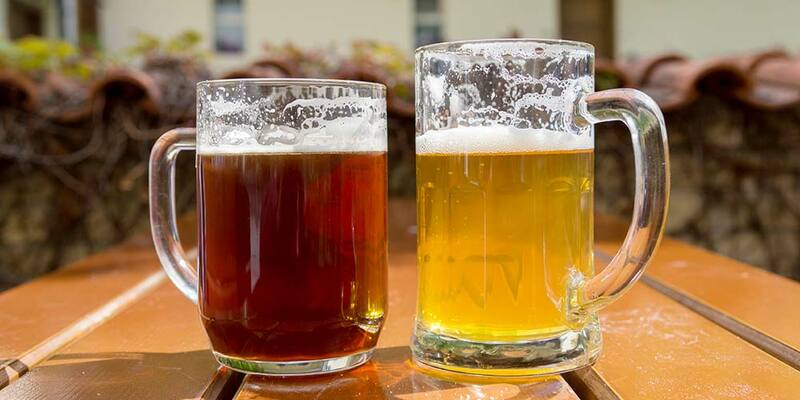 Ales include: Brown Ale, Pale Ale, IPA, Stout, Porter, Belgian Style, Wheat Beer. Lagers are made with more fragile yeast that settle to the bottom. These bottom fermenting yeast need more time and cooler temperatures to ferment. Lagers include: Pale Lagers, Pilsner, Dark Lagers & German Style Bocks. Tip: Ale starts with A, think A for 'Above' as in TOP fermentation. Also 'Above' for heat rises above. Lager starts with L, think L for 'Low' as in BOTTOM fermentation. Also 'Low' for cooler temps sink low to the bottom.